Posted June 9, 2016 by McIvor Farrell & filed under News. 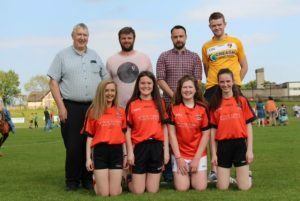 McIvor Farrell Solicitors Belfast are delighted, as part of our Community Outreach Initiative, to sponsor St Joseph’s Glenavy Girls Under 16s kit this season. 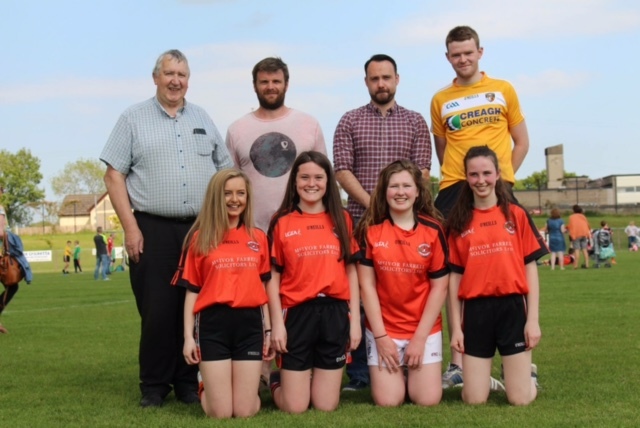 The girls are pictured here with Daniel McCorry presenting the team with their sponsorship. Everyone at McIvor Farrell wish the girls every success in the year ahead. Posted May 24, 2016 by McIvor Farrell & filed under News. We recently represented a Defendant in a significant supply of cocaine case involving a kilo of the drug with a purity level of 70% before Craigavon Crown Court. The matter was dealt with by Solicitor Advocate Paul Farrell who identified matters of exceptionality concerning the case and with the support of relevant expert reports persuaded the Court to mark the sentence with a short period in custody (6months) with an extended period of post release license in the community. We are delighted to have secured this result for the Defendant and are pleased to have identified issues in his case that persuaded the Court to deal with his sentencing in such an exceptional manner. Posted April 29, 2016 by McIvor Farrell & filed under News. Once again Belfast Solicitors McIvor Farrell have passed the LEXEL assessment with flying colours. LEXEL is a legal services competency standard confirming the highest standards of service and practice management and we are delighted once again to have met the high standards required. LEXEL co-ordinator Mr Ciaran Maguire has praised all staff for their efforts and ongoing commitment to providing first class legal representation to our clients. LEXEL accreditation ensures that all those who deal with McIvor Farrell can expect to receive ongoing high level representation and engagement from our professional and support staff at all times. Posted April 21, 2016 by McIvor Farrell & filed under News. The Applicant was not afforded an oral hearing by the Legal Services Agency on foot of an emergency civil application. The crux of the Applicant’s case is that regulation 26 and regulation 10 of the Civil Legal Services (Appeal) Regulations (Northern Ireland) 2015 are unlawful in that they restrict the discretion of the Appeal Panel in such a way that firstly seemed to serve no rational purpose and secondly in a way which undermined the independence of the Appeal Panel. Article 3 of The Access to Justice (Northern Ireland) Order 2003 provides that the Department shall secure that “individuals have access to civil legal services that effectively meet their needs, and promoting the availability to individuals of such services;”. This case raises complex and difficult legal issues. The Applicant contends that an oral hearing is an important safeguard which ensures procedural fairness. It is submitted that the outcome of these appeal proceedings could have a significant effect on Civil Legal Services. The Civil Legal Services Appeal Panel sits on a frequent basis to determine a variety of cases, many of which are of great public interest in their own right. Posted April 11, 2016 by McIvor Farrell & filed under News. Belfast Solicitors McIvor Farrell attended a meeting with the Secretary of State for Northern Ireland, Rt Hon Teresa Di Villiers today at Stormont with the family of a murder victim in order to impress upon her the need to provide adequate and immediate disclosures in relation to a Legacy Inquest we are conducting which touches on the issue of Police Collusion with Paramilitaries in the lead up to the murder and it’s subsequent investigation. Following a productive meeting the Secretary of State gave us an assurance that she would look into our concerns and correspond with the Chief Constable on our behalf. At McIvor Farrell we believe in the highest standards of client representation and are committed to achieving this in whatever forum is required and not necessarily limited to Court Representation. Posted December 26, 2015 by McIvor Farrell & filed under News. McIvor Farrell were happy to have been of assistance to this client during a particularly difficult time for him and would encourage anyone who has problems with any employment matter to contact us. Posted December 12, 2015 by McIvor Farrell & filed under News. The Applicant was refused an oral hearing in respect of the refusal of emergency legal aid. The Applicant now seeks a declaration that specific regulations within The Civil Legal Services (Appeal) Regulations (Northern Ireland) 2015 are procedurally unfair, unlawful, ultra vires and of no force or effect. In all the circumstances of the case it is submitted that the decisions of the Respondent to refuse the Applicant’s appeal and to refuse his request for an oral hearing, were irrational, unlawful and unfair. It is also said that Regulations within The Civil Legal Services (Appeal) Regulations (Northern Ireland) 2015 breach Article 6 of the ECHR by failing to give individuals appealing a refusal of an emergency application for civil legal aid an absolute right to an oral hearing. This is a case of huge public interest. The case raises complex human rights issues and ultimately it brings to the fore the notion of access to justice. The case will proceed to full hearing early next year. Posted December 11, 2015 by McIvor Farrell & filed under News. McIvor Farrell have now commenced a claim for compensation against the Ministry of Defence, PSNI and British Government in relation to allegations of Torture and Inhuman and Degrading Treatment on behalf of a client who was arrested, interned and subjected to the most horrific conditions of detention in the early 1970s. The Plaintiff was held without Trial and during his time in custody was subjected to numerous beatings, sleep deprivation and thrown from an Army helicopter blindfolded as it hovered above the ground. Solicitor Conor Woods has described it as a “landmark case that will have far reaching consequences for those who suffered greatly at the hands of State Forces during the recent conflict in Northern Ireland” and has encouraged others to come forward so that these past wrongs may be addressed. If you, or any family member, has suffered as a result of State violence during the conflict in Northern Ireland please contact us for a no obligation free consultation with one of our legacy solicitors without delay. Posted November 26, 2015 by McIvor Farrell & filed under News. Under cross examination from McKay Snr’s defence solicitor Paul Farrell, the officer accepted that he had been captured on CCTV at another location at the time of the shooting but still maintained that he remains as a suspect. The officer also conceded that Mr Gavin had made similar allegations of threats to kill against his father in law about a year ago but that McKay Snr was not prosecuted for it and that he had been on police bail for a considerable period before the case was dropped. Mr Farrell suggested to the detective that police had no evidence to link McKay Snr to the calls as they had been made from withheld numbers but DS Hawthorne refused to accept that, telling the lawyer his daughter and son in law had identified his voice. McKay Jnr’s solicitor Daniel McCorry submitted that with an alibi for the shooting and with a completely clear record, his client was also a suitable candidate for bail and revealed that despite police failures to locate his mobile phone, he had told them where it was and the passcode for it. Posted October 22, 2015 by McIvor Farrell & filed under News. We recently settled a claim for significant value against the Sunday Life Newspaper in relation a Defamation Action taken on behalf of a client wrongfully identified as being involved in a murder. We were delighted to have been of assistance in this difficult and emotionally demanding case. If you feel that you may have been defamed please contact our litigation experts without delay.